It may seem somewhat strange, at least on the surface, for a poet to be interested in strategy and a theologian in the world of intelligence analysis. We poets. however, have been termed “the unacknowledged legislators of the world” by Mr. Shelley, one of our own number, and we theologians long considered our study the Queen of the Sciences – so here we have the roots of attitudes that may flower into this strange hybrid being that is myself. It’s not easy to list significant writers who were also in the intelligence business, in part because both “writing” and “intelligence” are subject to varied definitions — so my own list here will lean heavily British, and have the patina of old age rather than the glamor of the freshly minted. 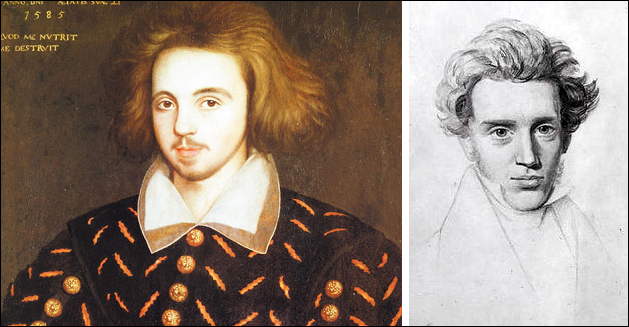 Let’s just say that Christopher Marlowe, who wrote the great play Doctor Faustus, was apparently sent on extended errands while up at Cambridge on “matters touching the benefit of his country”. More recently Rudyard Kipling, John Buchan, Somerset Maugham, Graham Greene, even JRR Tolkien apparently, Ian Fleming, John le Carré, and Anthony Burgess have been among British writers who were also spies, and Peter Matthiessen can serve as a distinguished recent American example. Yale’s literature specialists played a key role in shaping the agency’s thinking. Mole-hunter James Jesus Angleton, the most controversial figure in CIA history, began his career as an apprentice of the New Critics on Yale’s English faculty, and his literary training in “close reading” may have shaped his hyper-skeptical (some would say paranoid) approach to counterintelligence. Why do fine writers make decent intelligence analysts? Artists, in my experience, have very little centre. They fake. They are not the real thing. They are spies. I am no exception. I’d like to take that a little further. I’d like to say that to be a keen observer of human behavior, you must be a keen observer of your own – only one who has taken the beam out of his own eye can see clearly the mote that is in another’s. That brings you, I believe that chameleon-like condition of receptivity and observation that Keats termed “negative capability” in his letter to Richard Woodhouse of October 27, 1818. More on that in the Sufi story below. Now, onward to the two quotes that anchor this piece. Are not the final results one’s “strategy”? l am like a spy in a higher service, the service of the idea. l have nothing new to proclaim, I am without authority; myself hidden in a deception. l do not proceed directly but indirectly — cunningly; I am no saint — in short, l am like a spy who in spying, in being informed about malpractices and illusions and suspicious matters, in exercising surveillance, is himself under the strictest surveillance. See, the police also use such people. For that purpose they do not choose only people whose lives have always been most upright; what is wanted is only experienced, scheming, sagacious people who can sniff out everything, above all pick up the trail and expose. Thus the police have nothing against having such a person under their thumb by means of his vita ante acta [earlier life] in order precisely thereby to be able to force him unconditionally to put up with everything, to obey, and to make no fuss on his own behalf. It is the same with Governance, but there is this infinite difference between Governance and the municipal police — that Governance, who is compassionate love, precisely out of love uses such a person, rescues and brings him up, while he uses all his sagacity, which in this way is sanctified and consecrated. But in need of upbringing himself, he realizes that he is duty-bound in the most unconditional obedience. Jalaluddin Rumi has a story in his Masnavi, one of the many facets of which, I suspect, can illuminate this point, albeit a bit obliquely. He describes a contest that a sultan once held between the Chinese and Greek schools of artists, to determine which had the greater ability in art. Each school was given one half of a room, and a great curtain fixed between them. The Chinese, with a vivid appreciation of nature’s moods and humanity’s place between skies and mountains, painted their half of the room with exquisite care and subtlety. The Greeks took quite an other approach, covering the walls on their side with silver plate, then buffing and burnishing it to a brilliant reflective sheen. was mirrored on those walls with clarity. his eyes were stolen from their very sockets. Those who examine their own hearts — Ursula le Guin nicely calls them “withinners” since their voyages, adventures, discoveries and treasures are found primary within themselves — may make reluctant spies, for they do not easily see one side of a dispute as entirely right and the other side utterly wrong: but their nuance places them among the finest of analysts. Oh, but let’s be sensible and worldly: most of us like to balance our mundane lives with the more exciting possibilities that are their opposites, and espionage – the derring-do more than the analysis, to be sure – is a wonderful foil for scholars’ fantasies, just as being swept off one’s feet by a prince and loved tempestuously between the pages of a book is a sweet shift from the menial paper trails of office life, and space opera a fine venture for those beset by gravity and white lab coats. More sseriously, for the analysts and educators among our ZP readership — let me just suggest that the literary and humane arts will deepen analytic understanding as surely as big data will extend its technical reach.